RAPAPORT... Alrosa’s newest mine could become one of the company’s richest sources of large rough diamonds, recent testing has found. The Russia-based miner conducted experimentation, between March 11 to 15, at a previously untested portion of the Zapolyarnaya pipe, located at its Verkhne-Munskoye deposit. The purpose of the testing was to determine the quantity, color, grade and per-carat price of its diamond resources. The results yielded 239 stones weighing more than 8 carats each. Over a period of five days, Alrosa processed 100,000 tons of ore, which were then sent to its sorting center to be assessed. Among the large diamonds the company recovered were two gem-quality stones weighing 51.15 and 70.67 carats. The largest diamond unearthed was a lower-quality, 268-carat stone. Verkhne-Munskoye currently has four pipes. Previous testing at the other portions of the mine also uncovered large diamonds. Alrosa launched Verkhne-Munskoye — its most recent mine — in October 2018. 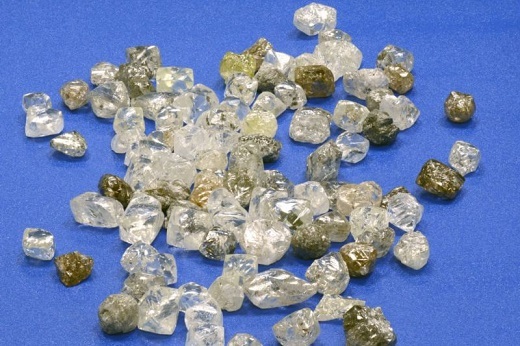 It is expected to produce approximately 1.8 million carats of rough diamonds per year until 2042. Separately, the company is now exploring Zimbabwe for future mining developments, but will only pursue a project in the country if it receives management and operational control of the deposit, it told Rapaport News. Currently, Zimbabwe’s indigenization laws require the country’s citizens to own at least 51% of any diamond mine. The government recently repealed those laws for other industries, including platinum.